I’m a little surprised we did it. J and I ditched cable. A couple of years ago, I couldn’t have lived without it. Recently, all I’ve been watching is PBS and a few broadcast network comedies, so there is really no reason for me to keep cable. Still, I wasn’t actively looking to get rid of it….that is until I got my most recent bill. Charter upped my bill another $20 a month and didn’t add anything. That was the last straw. At this point, it just wasn’t worth it. Sure, they eventually offered to drop it by $50 a month, but I’m not playing games. If you can charge me $50 less a month, just do it without me having to threaten you. So, this past weekend was spent on the roof setting up an OTA antenna and running new cable in the house. We were still keeping Charter for Internet, so I couldn’t just splice in to their line. After I got all of the wires routed and amplifiers and boosters on the TV, I asked J to call and tell Charter we didn’t need their cable TV services anymore. After that was done, J was heading to a class and L and I had nothing to do, so I told J we’d just take the DVR’s back to Charter and get that out of the way. I looked the address up and saw it was on Sprinkle Road. As we were both walking out the door, I asked J if she wanted pizza for dinner. She said she wasn’t really hungry, but she might eat a slice or two. Actually, I wasn’t really in the mood for pizza either, but I knew I was going to end up very close to a Jaspare’s Pizza and that is what actually ended up making pizza sound good. 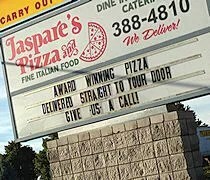 The Jaspare’s Pizza in Portage is on Sprinkle Road at the intersection with Milham Avenue in a small strip mall. This location is a couple years old now as they originally set up shop on the corner of Sprinkle and Kilgore when the moved in to the Portage area. 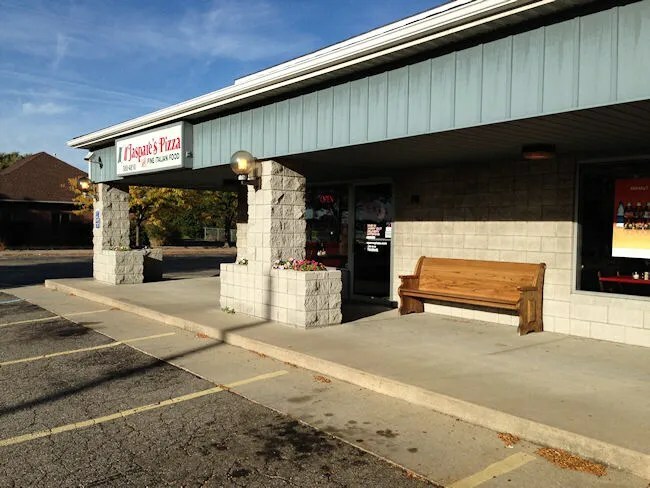 As I pulled in to the Charter parking lot, I pulled up the Jaspare’s menu on my phone and called in an order for a Large (14″) thin crust pizza with pepperoni on half and just plain cheese on the other half. I was told it would be about 15 minutes which gave me just enough time to turn in my DVR’s and go down the street to get gas and a bottle of water for L who was really asking for a “cup” (her sippy cup of water that I forgot at home). Monday’s are pretty slow pizza days, so the large restaurant was empty when L and I walked in. I headed straight to the counter and my pizza was waiting for me. I paid the $14 and headed back to the car. This little trip actually worked out real well as I only beat J home by a few minutes and she was hungrier than she thought she’d be when she got there. I put L in her high chair when we got home and cut a slice of the plain cheese up for her. The pizza was a delicious golden brown…almost well done. About the time I was getting L all situated, J got home and we sat down to eat. As J picked up a slice of cheese, she remarked that she always forgets how good Jaspare’s Pizza is. We just realized when the Stadium Drive location opened that they have a really good thin crust..yet we’ve only ordered from that location once…so far. I, of course, agreed with J. 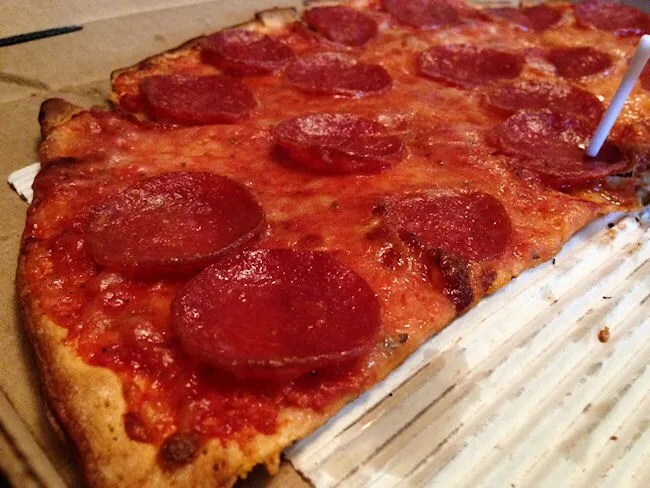 The super thin crust pizza had a New York style snap to it. The outer crust was pretty crispy, but the farther you got towards the center, the softer and chewier it got. The sauce has a little bit of a tang to it and the grease from the cheese and pepperoni create a wonderful flavor. 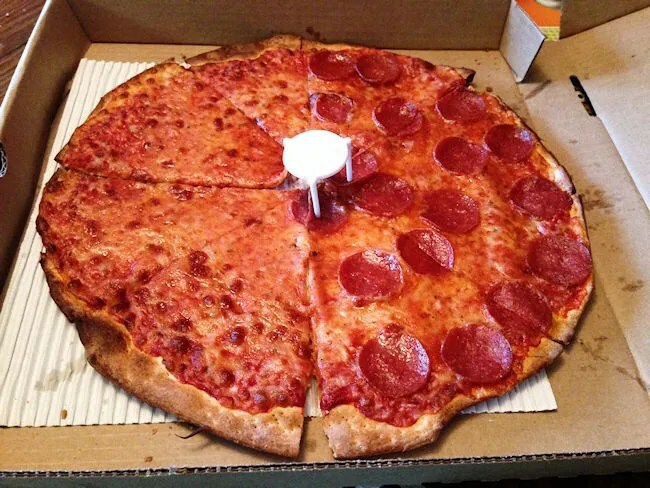 Even though neither J or I were really in the mood for pizza when I left that night, we both wanted more after we polished off the 14″ incher pretty quickly. I wish we’d stop forgetting about Jaspare’s…especially now that the Stadium Drive location has online ordering. We’ve been really happy with the pizzas the last few times we’ve ordered and definitely need to order from them more often. Thank you for delicious pizza!